This Recipe is very easy to make. It will take only 20 minutes. Here i made it for serving 2 persons. so you can add the quantity according to the number of persons. Preheat oven for 420 deg F in Bake mode. Take a microwave safe bowl, add in choco chip and butter. Microwave it for 1 minute. Mix the melted choco chip and butter using fork/spoon. Add powdered sugar and mix well. Add eggs in it and beat nicely. Finally add all purpose flour, mix it without lumps. Grease the baking bowl with butter, pour the batter in it. Bake for 12 minutes and let it cool for sometime. Run knife around the edges of the bowl , place a plate on the top and flip it carefully. 2. To decorate the heart shape in the centre.cut paper towel in heart shape, place it on the centre of the cake and sift powdered sugar on it. OWow! Is it that easy! Yummy !! looks soooo delicious ! Superb! 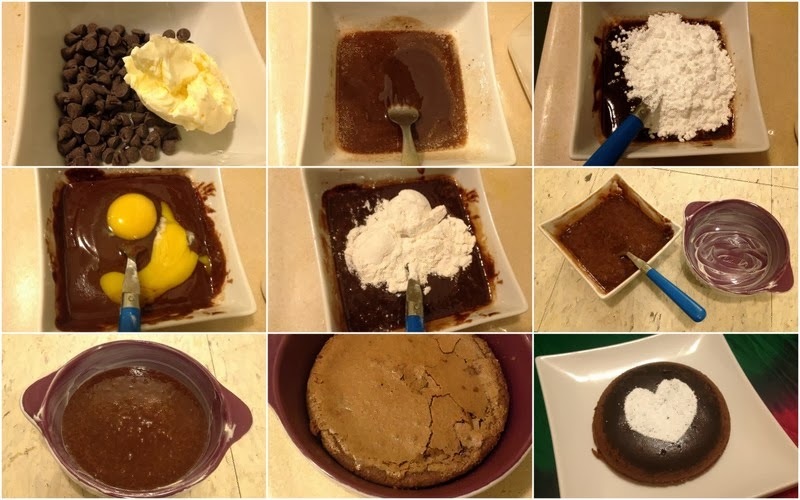 Beautifully baked and very well made chocolate lava cake. Delicious molten lava cake it is on my do list for long time. Looks great! Seems very easy! You explained it nicely! One doubt, is it possible to prepare this cake without egg? Thanks Sindhu! yes, u can make this without using eggs. Substitute 1 tablespoon cornstarch plus 3 tablespoons water for each egg. Had tried to make a choco lava cake before and it didn't go well. ..will definitely try this one...just a doubt - is there any alternative for the choco chips?? Yes, you can use 2 ounces of semi sweetened chocolate bar instead of choco chip. Thanks for dropping by! How and when did you do that heart thing? After flipped the cake. cut paper towel in heart shape, place it on the centre of the cake and sift powdered sugar on it. sorry for not mentioned in post. updated now. Thanks! looks so delicious and love that cute heart on top of it. that just looks so deliciouslyyy mouthwaterinng.